Make sure the meal replacement or weight management product you take passed our tests! In addition to measuring the protein, carbohydrates, and fats in every product, each was checked for contamination with arsenic, cadmium, mercury, and lead. "Gluten-free" products were checked for gluten. ConsumerLab.com identified some of the best quality meal replacement products and came up with a short list of its Top Picks. 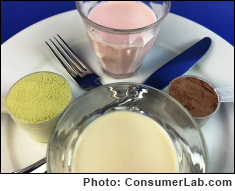 Also see ConsumerLab.com's Protein Powders & Shakes Review. Several ConsumerLab.com members have reported that the company which sells one of the meal replacement products which failed testing has notified them, in response to their questions, that the product's label is being updated to reflect the higher amount of sodium it contains -- as uncovered by ConsumerLab.com. However, that company appears to be downplaying (but not disputing) the cadmium contamination found by ConsumerLab.com. For details, see the Update in the full review.